This title is part of the Pearson print rental program. A modern, case study-based exploration of Management Information Systems. 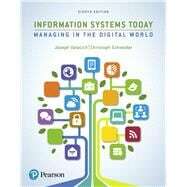 Information Systems Today: Managing in a Digital World opens each chapter with a case study so students can quickly understand how and why information systems are essential in today’s evolving business landscape. The authors selected cases that highlight real-world companies, technologies, and issues that illuminate the chapter topics. Aligning major concepts with the latest trends, the Eighth Edition explores how the rise of mobile computing, cloud computing, social media, the Internet of Things, and Big Data affect information systems. Valacich and Schneider continue to use real-world examples to further illustrate key points and help students retain valuable insights. Joseph (Joe) Valacich is an Eller Professor of MIS within the Eller College of Management at the University of Arizona, a Fellow of the Association for Information Systems (2009), and the Chief Science Officer (CSO) of Neuro-ID, Inc. He was previously on the faculty at Indiana University, Bloomington, and Washington State University, Pullman. He has had visiting faculty appointments at City University of Hong Kong, Buskerud College (Norway), the Helsinki School of Economics and Business, the Norwegian University of Life Sciences, and Riga Technical University (Latvia). He received a PhD degree from the University of Arizona (MIS) and MBA and BS (Computer Science) degrees from the University of Montana. Prior to his academic career, Dr. Valacich worked in the software industry in Seattle in both large and startup organizations. Dr. Valacich has served on various national task forces designing model curricula for the information systems discipline, including IS ‘97, IS 2002, and IS 2010: The Model Curriculum and Guidelines for Undergraduate Degree Programs in Information Systems, where he was co-chairperson. He also served on the task force that designed MSIS 2000 and 2006: The Master of Science in Information Systems Model Curriculum. He served on the executive committee, funded by the National Science Foundation, to define the IS Program Accreditation Standards and served on the board of directors for CSAB (formally the Computing Sciences Accreditation Board) representing the Association for Information Systems (AIS). He was the general conference co-chair for the 2003 International Conference on Information Systems (ICIS) and the 2012 Americas Conference on Information Systems (AMCIS); both were held in Seattle. Dr. Valacich has conducted numerous corporate training and executive development programs for organizations, including AT&T, Boeing, Dow Chemical, EDS, Exxon, FedEx, General Motors, Microsoft, and Xerox. He has served in a variety of editorial roles within various academic journals and conferences. His primary research interests include human-computer interaction, deception detection, technology-mediated collaboration, mobile and emerging technologies, and e-business. He is a prolific scholar, having published more than 200 scholarly articles in numerous prestigious journals and conferences, including: MIS Quarterly, Information Systems Research, Management Science, Academy of Management Journal, Journal of MIS, Decision Sciences, Journal of the AIS, Communications of the ACM, Organizational Behavior and Human Decision Processes, and Journal of Applied PsychologyI. He is a coauthor of the leading textbooks Modern Systems Analysis and Design (8th ed.) and Essentials of Systems Analysis and Design (6th ed. ), both published by Pearson. In 2016, Dr. Valacich was awarded the University of Arizona, Tech Launch Arizona, “Innovation & Impact Award” for Information Technology. He was awarded the “Distinguished Alumnus Award” from the University of Montana Alumni Association in 2012 and the “Outstanding Alumnus Award” from the University of Montana’s School of Business Administration in 2009. Dr. Valacich is also ranked as one of the most prolific authors in the history of MIS Quarterly—his discipline’s top journal—over the life of the journal (1977–2016) (see misq.org). Throughout his career, he has also won numerous teaching, service, and research awards. Christoph Schneider is an assistant professor in the Department of Information Systems at City University of Hong Kong and previously held a visiting faculty appointment at Boise State University. He earned a Swiss Higher Diploma in Hotel Management at the University Centre César Ritz in Brig, Switzerland, a BA in Hotel and Restaurant Administration at Washington State University, and a PhD in Business Administration (Management Information Systems) at Washington State University. His teaching interests include the management of information systems and web design. Dr. Schneider is an active researcher. His primary research interests include human-computer interaction, electronic commerce, and computer-mediated collaboration. His research has appeared in peer-reviewed journals, such as Information Systems Research, Management Information Systems Quarterly, Management Science, and IEEE Transactions on Professional Communication; further, he has presented his research at various international conferences, such as the International Conference on Information Systems, the European Conference on Information Systems, and the Hawaii International Conference on System Sciences. He serves as a member of the International Steering Committee of the International Conference on Information Systems Development (ISD) and as senior editor at Information Systems Journal.